Unroll crescents and spray a large pizza pan with nonstick baking spray. Place the longer end of the crescents in a circle onto the pan. Leave a circle in the center with all the crescent points laying over the the outside edge of the pan, all the way around the pizza pan, to create a sun-like ring of crescents. Spoon mashed potatoes, turkey, cheese, green bean casserole, stuffing, and cranberry sauce on top of the large ends of the crescents. Note: these recipe amount are approximate, please feel free to add or take away any of the ingredients that you like or don't like. The idea is to stuff the crescent ring with everything you love! Just don't stuff it more than about 3 high, or you will run out of crescent dough to cover your final dish! Pull the pointed edges of the crescents up and over the filling. Use a knife to gently tuck each crescent tip underneath the inside end of the crescent ring to secure. Bake in an oven preheated to 350°F for 18-22 minutes, or until the crescents are golden brown. Cool slightly before slicing and serving. You've got leftovers. What to do? 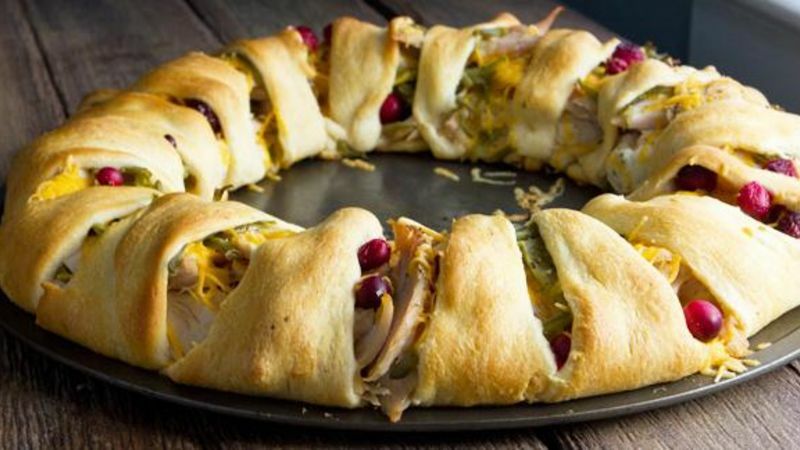 Stuff them into this crescent ring and reinvent your Thankgiving dinner! Thanksgiving dinner brings all the faves to the table. This recipe brings all of those dishes together in one delicious home-baked ring of Thanksgiving scrumptiousness. To get started, pop two tubes of Pillsbury Crescents open. Lay the fat ends in a circle around a lightly-greased pizza pan. You want them to criss-cross each other to create a nice base of crescent pastry for your final dish. Now layer everything you loved on Thanksgiving day atop your crescent ring. Mashed potatoes, gravy, turkey, green bean casserole, cranberry sauce, stuffing. All your leftovers belong here. This is the path to Thanksgiving leftover nirvana! Fold the skinny end of the crescents up and over your filling. I like to use a knife to gently guide the point end of the crescents under the filling. A good tuck keeps everything in place while baking. Call your people and let them know Day 2 of the harvest feast begins in 20 minutes! Bake in an oven preheated to 350 degrees F until golden brown.